What Will Make You Happier This Thanksgiving Holiday? What Will Make You Happier This Thanksgiving? 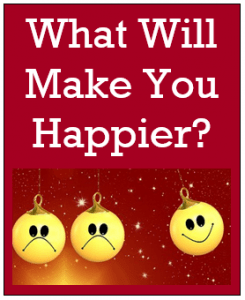 Curious what will make you happier this holiday season? With Thanksgiving right around he corner, here are a few simple, yet empowering ideas you’ll love. Below are five simple ideas to try to boost your mood during he holiday season. it all starts this week as you know. Choose one tip or try them all. But promise me you’ll do at least one. When it comes to what will make you happier, there are more options than I could ever fit into this one blog. Comparing yourself and your life to others is a surefire way to feel bad about yourself. No two people are alike and every one has some sort of problems. Even though the grass always looks greener, it’s probably not true. That’s just human nature. So, if you catch yourself wondering why your sister, neighbor or colleague’s life seems so much better than yours, bring your attention back to you. Think about what is going well in your life. We tend to ignore the good and focus on what’s missing. What will make you happier is to keep your eyes in your own backyard. If you’ve got time on your hands during the holidays, put it to good use. Go through your closet looking for items you no longer wear to donate. If you haven’t worn it in over a year, that is a clue you should donate it. You might also have apparel or accessories that no longer fit or are out of style. Look through your coats too – its getting cold out there. Clearing clutter feels fabulous and opens the door for new things to come into your life! You can also make room for a new man energetically by using Feng Shui principles. Feng Shui is an ancient Asian practice that promotes a healthy energy flow where you live and work. The idea is simple really – if you have two night tables, make sure one is empty with room for your man’s items. Make room in your medicine cabinet and also a little space in your closet. This is how you make room in your life for a new man energetically! There are people in your life right now who make a difference in your life. Maybe a sibling or other family members, your children or neighbors. Think about your good friends, the ones you can count on. People who are part of your faith community. Colleagues who have your back. Others who have helped you in some way or simply put a smile on y our face. Share your love and appreciation with these folks because they do not get enough acknowledgement. Let them know how much they matter. It might even be the teller at your bank or the person at the corner store where you get gas or coffee who always greets you with a smile. Let them know they brighten your day. Spread love and you will feel happier and uplifted. No matter what is missing in your life or not working, there are always things that are going right. But part of human nature is not to notice what is working. We tend to focus on lack and what’s going wrong. Time to shake things up! Making a mental list is not really enough. Take out a sheet of paper or use your note function on your phone and make a LIST. This way you have a physical record you can refer back to when you go off the rails and forget about all the things you can be grateful for. Don’t forget how you can afford lights and heat, a good meal, a warm coat, sunshine and more. The little things add up! Thinking about what will make you happier, why not make a list of those things too? it might be to laugh at something every day, smile more, get out into the sunshine, walk in nature, a good cup of coffee, a piece of dark chocolate, a glass of wine, snuggling with your pet, or watching a funny movie. Don’t just create the list – do them. For readers in the US celebrating Thanksgiving this week – may your holiday be enjoyable and a sweet memory. As my gift of thanks to you, click here to listen to a Q & A recording on dating after 40 – the recording is just over an hour and is packed with helpful tips, inspiration and eye-opening insights into understanding men. Are All Men Liars, Cheaters and Unworthy of You? Why Won’t He Tell Me The Truth?